I bet every morning after Anthony Thomas wakes up, he quickly hits up, up, down, down, left, right, left, right, B, A before starting his day. That way if he gets hit by a bus or something it won’t matter cause he’s got 29 more lives! 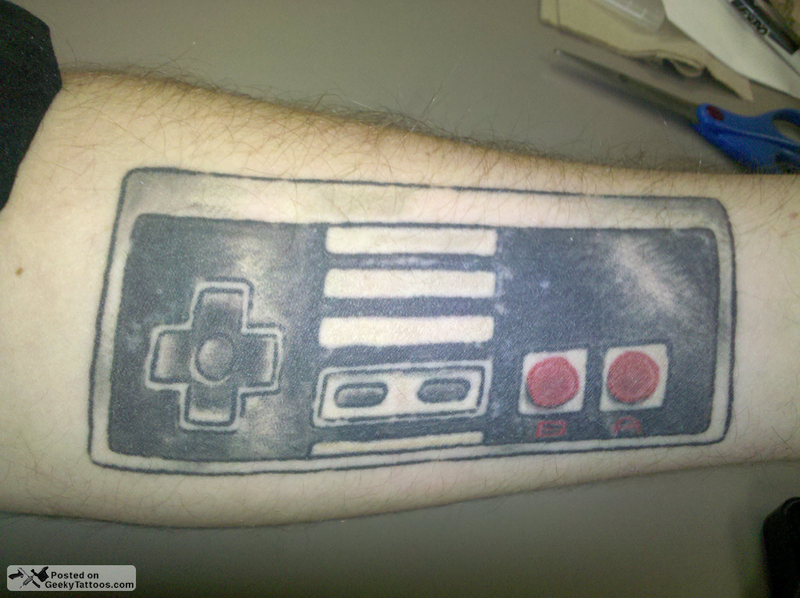 Anthony, aka CrispyRaccoon, says he got this done at the Blue Horseshoe in Virginia beach because he has dedicated his life to video games, design, and gaming. It’s his first tattoo of a planned sleeve of geeky gaming tattoos. Tagged with arm, Blue Horseshoe, controller, Nintendo. Not to disrespect or anything, but perhaps you should find yourself another tattoo artist for your upcoming sleeve. Just my two cents..
find a new tattoo artist. never go back to that one again. if you want to get a good one, you have to find someone who is good with shadow and line. nice share, could be she/he used to be like playing game.